Atria/ Emily Bestler Books Pub. 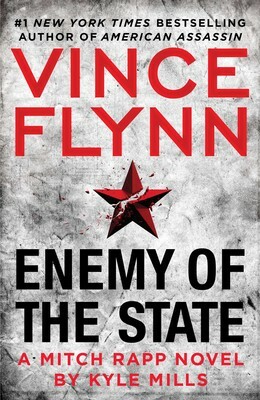 With ENEMY OF THE STATE, Kyle Mills has found his groove as he nailed down the characters created by Vince Flynn. As other thriller authors pivoted away from terrorism, Mitch Rapp, Dr. Irene Kennedy, and company continue to keep America safe by thwarting Islamic jihadists. As in THE THIRD OPTION, this plot has Mitch Rapp going somewhat rogue after being asked by the President to perform a mission that is completely off the books. He must track down, interrogate, and kill members of the Saudi royal family who appear to be working with ISIS. Although Irene knows about it she and Mitch realize this must be a completely black ops mission; thus, his resignation from the CIA. The investigation discovered Aali Nassar, Irene’s Saudi counterpart, promising to support America, while secretly in charge of the ISIS financing and eyeing the chance to overtake the country’s government once King Faisal dies. Nassar frames Mitch giving him an excuse to hunt down the one man who might foil his plan to fund ISIS and bring about a Middle East superpower to threaten the US. He gets the US President to agree to have FBI Agent Joel Wilson work with him to find Mitch. The action never stops as Mitch tries to keep one step ahead of his pursuers and to expose Nassar for what he truly is, a covert terrorist. To help Mitch, Mills has brought back some old familiar faces, while giving others a backseat. The character Dr. Irene Kennedy is central to any book. Mills realizes no Mitch Rapp book can succeed without her dominant presence. The scenes with her are a pivotal piece of the plot. Even a few pages speak of Irene’s son Tommy. The logistics leader of the team is Claudia Gould who has both a professional and intimate relationship with Mitch. Because she has a six-year-old child, Anna, when at home Mitch gets to play dad. These scenes are a welcome relief and venture back to the first books when Vince Flynn would include some of the character’s personal life. What Mills has brilliantly accomplished is the humanizing of Mitch. It is interesting to see the two sides of Rapp, a take charge, non-nonsense patriot, a take no prisoners guy, while acquiescing to Claudia at home.